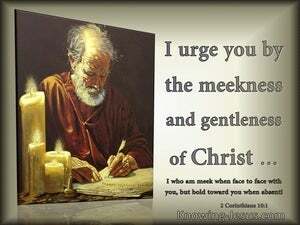 ﻿ 2 Corinthians 10:1 Now I, Paul, myself urge you by the meekness and gentleness of Christ--I who am meek when face to face with you, but bold toward you when absent! Now I, Paul, make a personal appeal to you by the gentleness and graciousness of Christ-I who am humble among you in person, but bold toward you when absent. Now I myself, Paul, plead with you with the gentleness and kindness of the Messiah I who am humble when I am face to face with you but forceful toward you when I am away! Now I Paul myself entreat you by the meekness and gentleness of Christ, who indeed am lowly in presence among you, but am bold toward you when absent. Now I myself, Paul, beseech you, by the gentleness and consideration of Christ [Himself; I] who [am] lowly enough [so they say] when among you face to face, but bold (fearless and outspoken) to you when [I am] absent from you! I, Paul, myself urge you, by the meekness and gentleness of Christ, I who am humble when face to face with you, but bold to you when I am away! I appeal to you personally, by the gentleness and forbearance of Christ? ?he Paul who is so humble when face to face with you, but so bold in dealing with you when he is far away! And I myself, Paul, beseech you by the meekness and gentleness of Christ; I, who indeed to look upon am lowly among you, but being absent am bold toward you. I Paul myself beseech you by the meekness and softness of Christ, which when I am present among you, am of no reputation, but am bold toward you being absent. Now I Paul, myself, appeal to you by the humble-heartedness and selflessness of Christ? ?aul who "in your presence is humble, but bold enough when he is absent"? ?2 I beseech you, and I say, do not make me show my boldness, when I come in the boldness with which I think I shall show my courage against some who think that I am walking on the low level of the flesh. Now I Paul, myself, entreat you by the humility and gentleness of Christ; I who in your presence am lowly among you, but being absent am of good courage toward you. NOW I Paul myself exhort you by the meekness and gentleness of Christ, who, when present, am indeed lowly among you, but being absent, am bold towards you. But as for me Paul, I entreat you by the gentleness and self-forgetfulness of Christ--I who when among you have not an imposing personal presence, but when absent am fearlessly outspoken in dealing with you. Now I appeal to you in person, by the gentleness and fairness of Christ, I, Paul, who am so "condescending when face to face with you, but so courageous toward you when far away!" 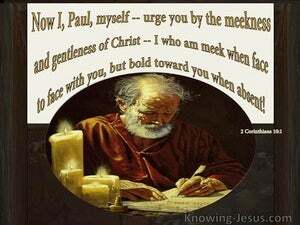 1 Now I, Paul, myself urge you by the meekness and gentleness of Christ--I who am meek when face to face with you, but bold toward you when absent! 2 I ask that when I am present I need not be bold with the confidence with which I propose to be courageous against some, who regard us as if we walked according to the flesh. And in Your majesty ride on victoriously, For the cause of truth and meekness and righteousness; Let Your right hand teach You awesome things. The greeting is in my own hand--Paul. Great is my confidence in you; great is my boasting on your behalf I am filled with comfort; I am overflowing with joy in all our affliction. To my shame I must say that we have been weak by comparison But in whatever respect anyone else is bold--I speak in foolishness--I am just as bold myself. If I have to boast, I will boast of what pertains to my weakness.